Joint pain or degeneration? Brain issues? Feeling the effects of aging? 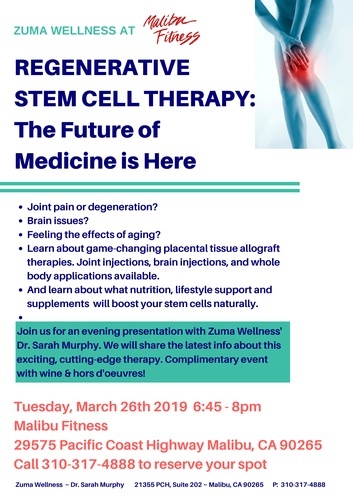 Join Zuma Wellness' Dr. Sarah Murphy for an evening presentation at Malibu Fitness to learn about cutting-edge stem cell therapy and its' long-lasting benefits. Also, find out if you are a candidate for this amazing treatment! Complimentary event with wine & hors d'oeuvres!